MISSOULA, Mont. 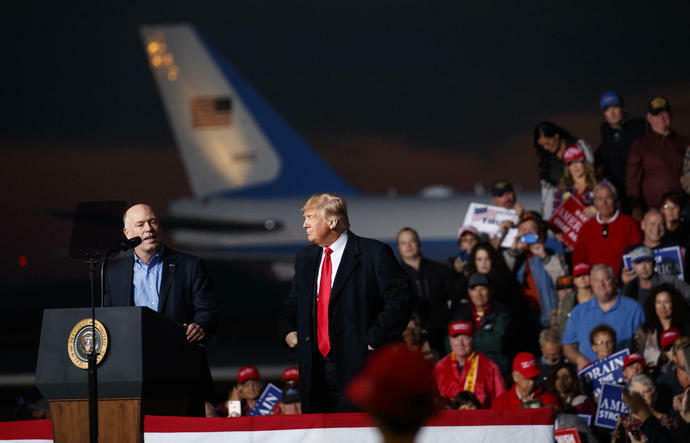 (AP) -- President Donald Trump praised a Republican congressman for body-slamming a reporter last year, calling him a "tough cookie" and saying he thinks it might have helped him win election in Montana. At a campaign rally in Missoula Thursday, Trump lauded Rep. Greg Gianforte, who pleaded guilty to misdemeanor assault for an attack on Guardian reporter Ben Jacobs. The attack came a day before Gianforte won a 2017 special election to serve the remaining 18 months in the House term vacated by now-Interior Secretary Ryan Zinke. "Any guy that can do a body slam - he's my kind of guy," Trump said to cheers and laughter from the crowd. "He's a great guy, tough cookie." His remarks praising Gianforte come amid an international furor over the apparent assassination of a Washington Post columnist, who, according to an account in Turkey's Yeni Safak newspaper, allegedly had his fingers cut off and was decapitated inside a Saudi consulate in Istanbul two weeks ago. "And I said, oh, this is terrible. He's going to lose the election," Trump recalled. "And then I said, well, wait a minute. I know Montana pretty well. I think it might help him. And it did." Gianforte, who attended the rally with the president, is up for re-election in November and faces former state legislator Kathleen Williams. The president's next stop on his three-day trip out West is Arizona.